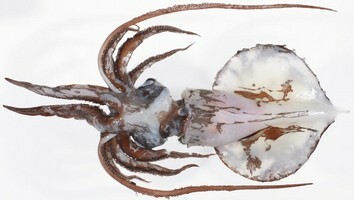 The original description of I. cordiformis is based on a single male squid, 80 mm ML with intact tentacles, taken in the Indian Ocean near Sumatra. It has been subsequently described from Japan (Sasaki, 1929) and the Philippines (Voss, (1963). This is the largest of the mastigoteuthids reaching a size of 100 cm ML (A. Salcedo-Vargas, personnal communication). Figure. I. cordiformis. Left - Ventral view of freshly captured squid, 325 mm ML. Photograph by Mark Norman. Right - Ventral view of the holotype, 83 mm ML. Drawing from Chun (1910). with club bearing very large suckers (ca. 0.5 mm) at proximal end. Arms III much longer than arms I. Figure. Anteroventral view of I. cordiformis, same squid as in title photograph, showing tentacle club emerging. Note large club suckers. Submersible photograph at depth of 1200-1400 m. © Hawaii Undersea Research Laboratory, Univ. Hawaii, Marc Slattery, P.I. Proximal club suckers much larger than other club suckers. Largest proximal suckers 0.5 mm or larger. Figure. 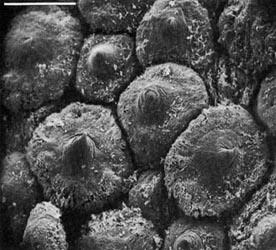 Oral view of the tentacular club of I. cordiformis. Note the large suckers at the proximal end. Top - Holotype, 80 mm ML. Photograph by R. Young. Bottom - Large specimen (>30 cm ML), fresh, Australian waters. Photograph by Mark Norman. Beaks. Description of the beaks can be found here in 2D. Beaks: Descriptions can be found here in 3D: Lower beak; upper beak. Funnel locking-apparatus ear-shaped with tragus and antitragus. Fin length (anterior extent to insertion on tail) 75% of ML (Chun, 1910). 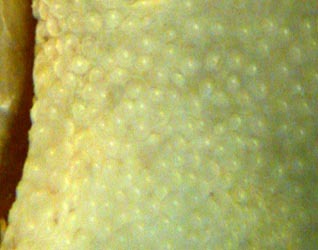 Mantle and other skin covered with small, conical tubercules arising from round plaques. Figure. 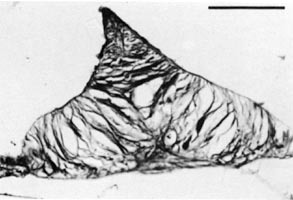 Left - Ventral view of a portion of the eyelid of I. cordiformis, holotype, 80 mm ML, showing tile-like arrangement of tubercules. Photograph by R. Young. Right - Scanning electron micrograph with an external view of mantle tubercles of I. cordiformis, 87 mm ML, Philippine waters, 14°N, 121°E. The tubercules are very similar to those of Mp. hjorti. Photograph from Roper and Lu (1990). Figure. 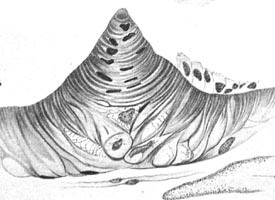 Left - Histological section through a skin tubercule of I. cordiformis, holotype. Most of the epithelium has been lost except along one flank of the tubercule. Drawing from Chun (1910). Right - Cross-section through a tubercule of I. cordiformis using scanning electron microscopy. Photograph from Roper and Lu (1990). Most pigment in densely packed chromatophores. The descriptions of Chun, Sasaki and Voss contain differences in the shape of the funnel locking-apparatus and the structure of the suckers. The significance of these differences remains to be determined. I. latipinna Sasaki, 1916 (see description under "Species of doubtful validity..." in the Nomenclature section of the family page) is probably a junior synonym of I. cordiformis. I. cordiformis is most similar to Mp. hjorti but differs in the absence of ocular photophores and the presence of enlarged proximal club suckers among other features. Type locality: Indian Ocean south of Sumatra at 0°15'N, 98°8'E. Also known from southern Japanese (Sasaki, 1929) and Philippine (Voss, 1963) waters. Roper, C.F.E. and C.C. Lu 1990. Comparative morphology and function of dermal structures in oceanic squids (Cephalopoda). Smithson. Contr. Zool., No. 493: 1-40. Sasaki, M. 1929. A Monograph of the Dibranchiate Cephalopods of the Japanese and Adjacent Waters. Journal of the College of Agriculture, Hokkaido Imperial University, 20(supplement):357 pages. Voss, G. L. 1963. Cephalopoda of the Philippine Islands. Bull. U. S. Nat. Mus., 234: 1-180. Page: Tree of Life Idioteuthis Sasaki, 1916. Idioteuthis cordiformis (Chun, 1908). Authored by Richard E. Young and Michael Vecchione. The TEXT of this page is licensed under the Creative Commons Attribution-NonCommercial License - Version 3.0. Note that images and other media featured on this page are each governed by their own license, and they may or may not be available for reuse. Click on an image or a media link to access the media data window, which provides the relevant licensing information. For the general terms and conditions of ToL material reuse and redistribution, please see the Tree of Life Copyright Policies.